Makai is currently available to see and sail in Marsh Harbor Bahamas. Makai is in charter management and is scheduled to do the Annapolis Spring Boat Show April 2019 and will be released from here promotional marketing program May 2019 or can stay in the promotional marketing program in the Bahamas. 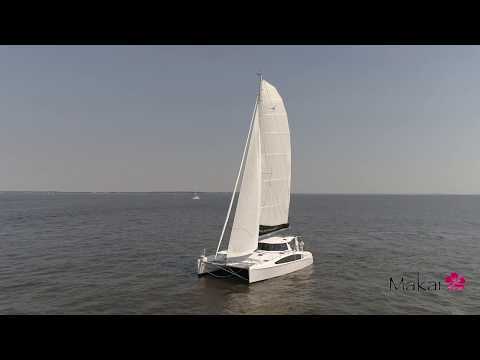 The Seawind 1260 is built by Seawind most experienced shipwrights (many who have been with the company for over a decade), in a new production facility located in Vietnam - using resin infusion technology, for superior structural quality and strength - all standard on a Seawind but necessary if you are going to cruise around the world. The overall finish of the Seawind 1260 will be consistent with a luxury world-standard yacht of this size and type. Only very high-quality equipment is used throughout. Standing Rigging - Forestay 3/8 (10mm) 1 x 19 Dieform wire. - Sidestays 3/8 (10mm) 1 x 19 Dieform wire - Diamonds 5/16 (8mm) 1 x 19 Dieform wire. Halyards - Main halyard: 12 mm Spectra rope : Heavy duty shackle. - Genoa halyard: 8 mm Spectra rope. Heavy duty shackle. - Topping lift: 10 mm rope, Heavy duty shackle. - Spinnaker Halyard: 12mm rope with snap-shackle spliced to end. Marine grade tinned electrical wiring with extensive use of heat sealed connectors.. Batteries x 3 comprising: House System (400 amp hrs) : 2 x 200 amp hr AGM (Absorbed Glass Matt) deep cycle / heavy duty batteries. One engine cranking battery – 700 CCA AGM.